2018 has been a big year for Magento, our merchants, and our community. We are excited to announce the latest version of the Magento platform to help continue that success into 2019. Magento 2.3.0 is here with new tools to help merchants fuel their growth while empowering developers to deliver on client expectations faster and more easily. Assign products and quantities to each fulfillment source, such as warehouses, stores, distribution centers or third-party drop shippers. Track inventory at each source for easier management of inventory. Streamline operations with rules to prioritize and automatically control the inventory sources that are used to fulfill orders for each website in real- time. Even merchants with a single inventory source benefit from MSI with an inventory reservation system that tracks deductions from the salable product stock when customers add products to carts. This results in accurate quantity counts and high performing checkouts that improve conversion rates. Smartphone penetration is expected to reach 90% in 2019 with nearly three-quarters of consumers engaging in mobile shopping. Progressive Web Apps (PWA) enable merchants to deliver superior mobile experiences that boost conversion rates and increase engagement. PWA Studio provides tools that will make it faster and cheaper to build Magento-powered PWA experiences. With PWA studio, merchants can deliver app-like mobile commerce that is fast, integrated, and reliable. These experiences are proven to improve SEO and to drive 50% higher conversion rates, and 50% better page performance on average. Designed with the developer in mind using reference themes, guided development, and open web standards, PWA Studio also speeds time to market and lowers the total cost of ownership. 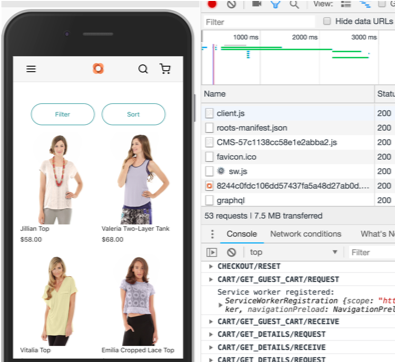 As an open source initiative, PWA Studio will have regular updates—independent of Magento releases—rapidly adding new features, reference theme enhancements, and quality improvements. With developers and partners already building PWAs we are excited about the future of front-end development on Magento. For information on how to work with PWA Studio and visibility into our roadmap visit pwastudio.io. Gone are the days of creating pages and managing site content using HTML and CSS. 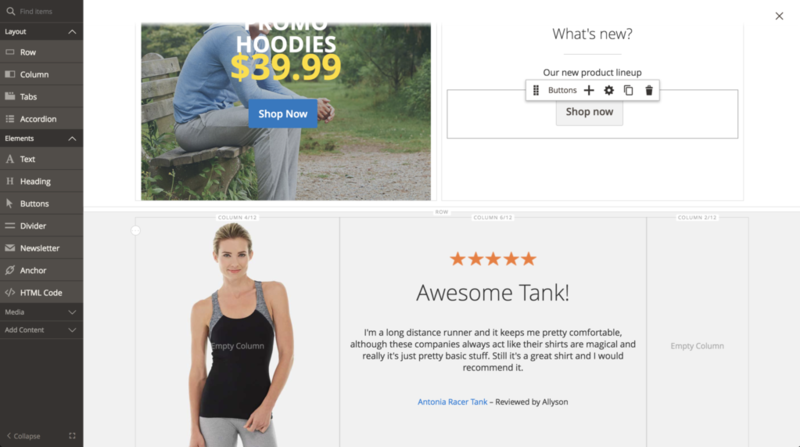 Available for Magento Commerce, Page Builder introduces an intuitive, drag-and-drop interface; a powerful set of content types like images, videos, and banners; and instant preview capabilities that enable non-technical users to take control of their content. Now you can create new pages, enrich products and categories, and launch content updates quickly and easily without the help of a front-end web developer. A flexible grid system allows you to position page elements in a highly customizable way and in-context text editing streamlines the whole process. The appearance and behavior of content types can be quickly tuned to accommodate any design. Page Builder is fully integrated with existing Magento functionality such as media gallery and widgets so you can incorporate these assets into your pages. You can also use Page Builder to create dynamic content blocks used throughout your site, and you can schedule content to go live in the future with content staging and preview. Page Builder currently has limited availability for our Early Adopter Program. Page Builder will be Generally Available for all Magento Commerce customers as part of the upcoming Magento 2.3.1 release. 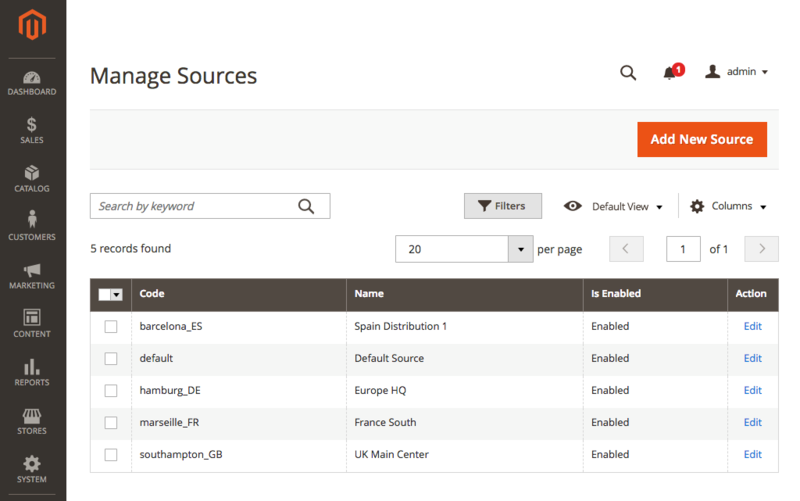 Magento Shipping – Added support for new fulfillment options and expanded global availability. GraphQL – a flexible and performant storefront API with rich developer tooling that is integrated into the Magento API ecosystem. Developers will be able to more easily query specific data elements from APIs in a single request. GraphQL’s focused responses provide faster and more predictable presentation results, even on slow networks. Declarative schema – Ease the upgrade and installation process by allowing developers to declare the final desired state of the database and have the system adjust to it automatically, without performing redundant operations. Improved indexing performance – Sharding and parallel processing of indexers reduces indexation times by over 60% to support larger sites and quicker product updates. New security tools – Help further secure your stores and prevent fake logins with Google ReCAPTCHA and Two Factor Authentication. For more information about everything that’s included in Magento 2.3.0 we encourage you to review the release notes. We are excited to end 2018 with a new set of powerful eCommerce solutions and we look forward to continuing to grow with your business into the new year! Learn more about all the latest Magento Commerce benefits and features here.